The HolidayIllnessClaim travel law experts have helped a British holidaymaker successfully receive over £5,000 in compensation after her young daughter was struck by salmonella on holiday in Turkey. Our client travelled to the five-star Marmaris Palace Hotel in July 2014 and soon fell ill, experiencing vomiting every 30 minutes at its peaOur client, who was just 5 years old at the time, continued to suffer from illness symptoms for the remainder of her ruined holiday and even upon her return home. It was upon her return to the UK that our client sought medical attention from her own GP. 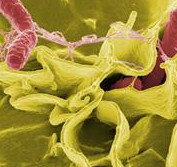 A stool sample was provided and tested positive for the salmonella bacterium. This diagnosis was of little comfort however as our client remained plagued by bouts of gastric distress months after the close of her Turkish holiday, and was subsequently diagnosed with post-infectious irritable bowel syndrome. In a particularly worrying comment, she also recalls that hotel staff would not wear protective clothing when transferring food and claims to have seen sweat from a hotel worker drip into food for guests. Acting on a no win no fee basis, Litigation Executive Darren Bibby successfully negotiated a £5,350 compensation pay out for the young holidaymaker. This sum was awarded with tour operator, Thomas Cook, admitting liability. Commenting on the case, Darren said: I am pleased with this result and delighted that I was able to help our client following her illness at Marmaris Palace Hotel. Salmonella gastroenteritis is a serious intestinal infection that is not only unpleasant but can lead to complications as in our clients case. If you or your loved ones are unfortunate enough to suffer from illness symptoms such as sickness and diarrhoea on a package holiday, I would always advise that you report your illness and seek medical attention as soon as you are able to. Even if you have returned from holiday, a check up with your GP could help to better diagnose your illness and suggest any possible treatment options. Sun, sea and salmonella on your package holiday? As long as your ruined holiday was booked as a package and was within the last 3 years, you too could be entitled to thousands in compensation following food poisoning on holiday. Call 0800 01 54321 to discuss your case with Darren, or any one of our dedicated team. Or, if youd prefer that we call you, answer a few questions online and well be in touch shortly.